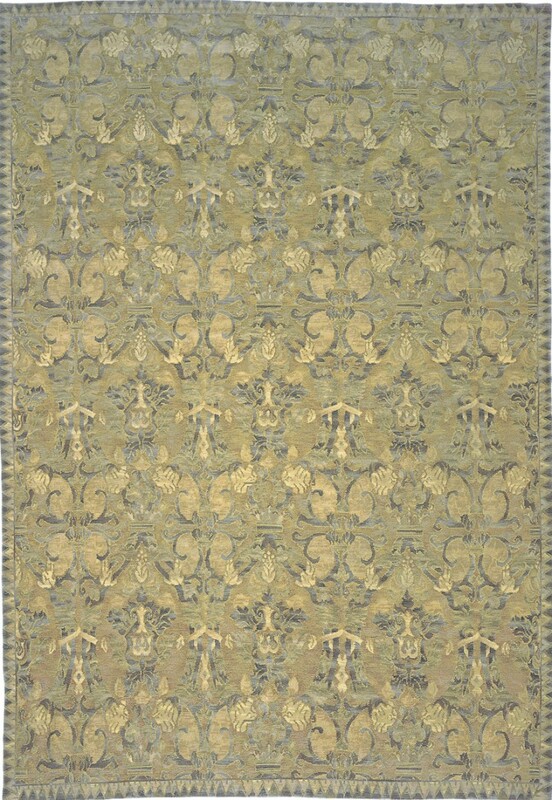 Lovely Morena was inspired by 16th Century Spanish rug design and Renaissance-era damasks. The palmette, leaf and oval lattice scroll pattern is rendered in shades of midnight to dusky blue displayed on an ivory, camel and bronze ground set within a contrasting border design of repeating pyramids. This hand made cut & loop rug was artfully created by combining loop weave and distinctive Savonnerie pile weave techniques for a distinctive sculptured look. Expert use of time-honored French dyeing methods creates a myriad of shade and texture variations reminiscent of ancient Pompeii frescoes.